Health board deficits have fallen by 42% over the last year - but there are still worries about Wales' largest. Latest end-of-year projections see a combined deficit of £97.4m across Wales' seven health boards. But while three have broken even in the last 12 months, in north Wales Betsi Cadwaladr's deficit has risen to £42m. Complex adult care, mental health costs and hiring agency nurses to cover staff shortages at Glan Clwyd and Wrexham Maelor hospitals are factors. Hywel Dda had the highest deficit in the previous year - £69.4m - but is now on track to meet its forecast deficit of £35.5m, thanks to a £27m Welsh Government injection. It still points to pressures on costs due to delayed discharges of medically fit patients and making staff and beds available to treat patients coming through hospital doors. 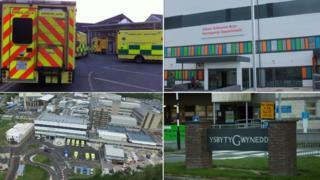 But Huw Thomas, director of finance at Hywel Dda, said there had been a "robust management" of cost pressures. "This will be a significant achievement for the health board and is a result of the tireless work and dedication of all of our staff, to whom we are very thankful," he added. Betsi Cadwaladr's problems have led to it being under special measures since 2015 - with the Welsh Government keeping a close eye on how it runs hospitals and other health services in north Wales. Its latest financial report points to its failure to make enough savings - £6.7m short of what it aimed to do - and cost pressures in particular areas. Staffing shortages have also been a long-standing problem and Wrexham Maelor and Glan Clwyd between them are spending £1m a month on agency nurse cover alone. A spokesman said: "The year-end forecast is between £40m and £42m, dependent upon the final waiting list position. Our planned budget deficit for 2018/19, agreed by Welsh Government, was a deficit of £35m". Cardiff and Vale said it was confident that it would deliver a "significant improvement" on last year's £26.9m deficit - an estimated £9.9m. Health Minister Vaughan Gething has also taken the health board out of financial monitoring and accepted its three year plan for the future, saying it had "worked constructively and maturely with my officials to address a number of delivery and financial issues". Abertawe Bro Morgannwg said it was on a target with its £10m forecast overspend and was "managing a number of potential risks" to meeting this. From this weekend, its boundaries have changed, with Cwm Taf taking over responsibility for hospitals and health services in Bridgend. Cwm Taf has been breaking even since 2009 and a spokeswoman said: "Being in a balanced financial position helps us to address the challenges that all health boards face to meet the needs of an ageing and growing population." Meanwhile, Aneurin Bevan and Powys health boards both broke even for a second successive year. Overall, this will be very welcome news to the Welsh Government. Three out of the four "big spending" health boards have to a certain extent managed to rein-in their wallets. In Hywel Dda's case that is partly due to the fact it is now getting more cash to start off with - after a review concluded it had particular needs due to its population and geography. And remember, recent Welsh Government budgets have been generous to the NHS as a whole. Overall, nevertheless, it is a more positive picture at a time of when demand for care is soaring. There will be more health board finance directors smiling this weekend than at the end of the last financial year. The big worry, as ever, is Betsi Cadwaladr. It's now got the biggest deficit of all, and that overspend is higher than last year. And with continuing problems - such as long waiting times, staff shortages and, according to the Audit Office, the lack a "transformative" plan for the future - there does not seem to be much prospect of it coming out of 'special measures' anytime soon. How much pressure is Hywel Dda health board under?